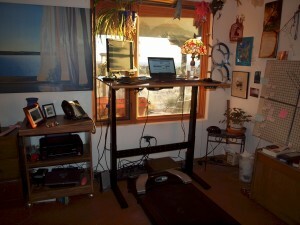 Grand Opening: My New Treadmill Desk! 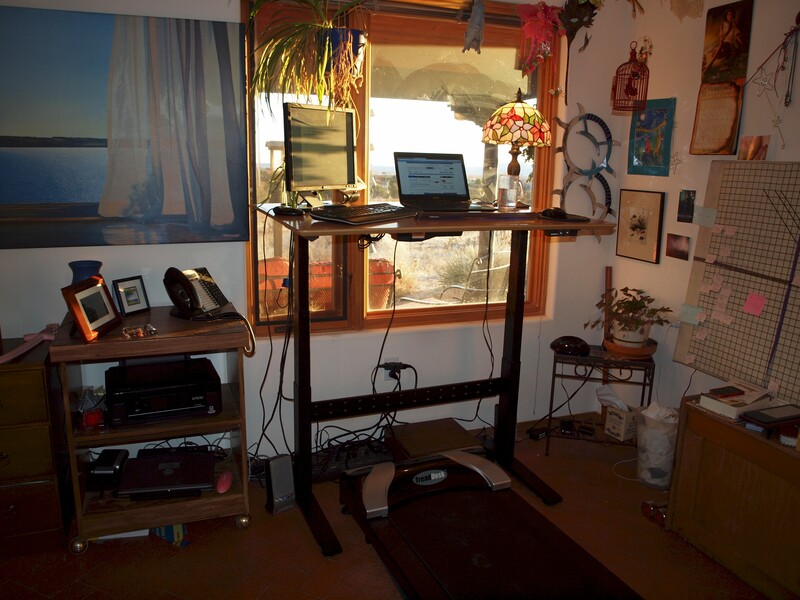 As promised, the definitive post about my new treadmill desk! I finally got the desk pieces delivered Tuesday, though I got the treadmill piece quite a while ago. So now I’m all assembled and rocking along. In fact, I’m walking on the treadmill as I write this! As you can see, I have a small space. If I did one of the less expensive all-in-one treadmill desks, it would be in addition to my regular desk, and I didn’t want to sacrifice the room. I like being able to look out my window and enjoy the view. There’s not enough window for both kinds of desk. I didn’t already have a treadmill to jury-rig. I’m at my desk about 11 hours a day, sometimes more. I do the the day job from home. So, on top of the writing career, I’m at my desk a good chunk of the time. I wanted a good, long-term solution that would fit my life aesthetically and ergonomically. For me, this is a health investment. I’d rather spend the money on this now than on health care in the future. So, being who I am, I did a lot of online shopping and cross-comparisons. I ended up buying the treadmill itself here. I like that it’s small, highly rated and has a control panel that sits up on the desk. They also sell adjustable height desks, but I found a better deal on the desk elsewhere. My big thing is I wanted this, too. 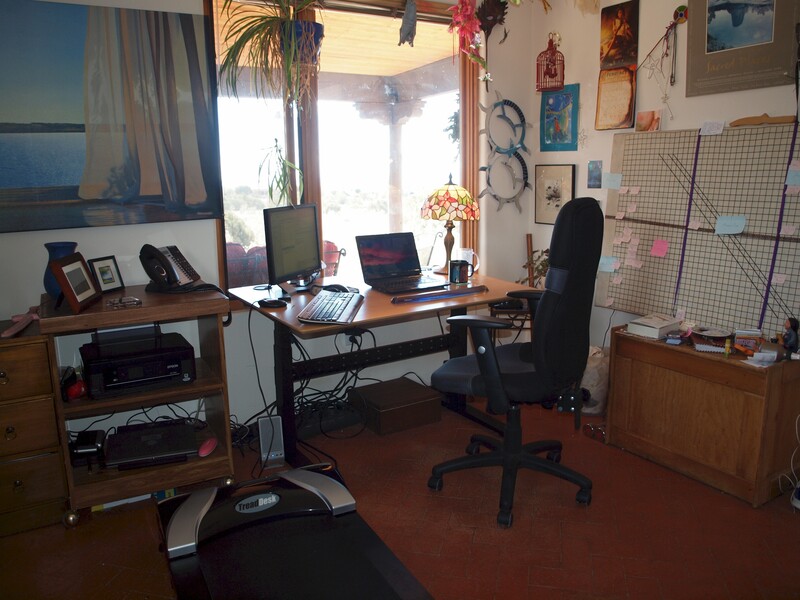 Same desk, with the treadmill slid to the side, so I can sit and work, too. It works via a hydraulic lift that is very smooth and nearly soundless. This way, if I’m sitting and working and get a long phone call from my boss, say, I can raise the desk, slide the treadmill over and walk and talk–and still reference information on my computer. I bought the desk here. I got the v.3 small frame (space considerations), even though they’re running 5-7 weeks out for delivery. Treaddesk, where I got the treadmill piece, has a similar desk that’s very pretty, and they sell it as a package. However, by buying these two pieces separately and saved $640. Plus, if Treaddesk ships it as a package (cheaper than doing the pieces separately with them), they have to send it to a loading dock and not your house. Which I just did not want to deal with. How do I like it? I do! The treadmill goes a max 4 mph and right now I’m walking at 1 mph. The treadmill is a bit heavy to slide, but not awful. The brick floors help. If I were to do this on carpet, I’d likely want one of those plastic aprons they sell at office-supply stores. Looks great! I’ve thought about doing something similar, but am kind of worried about tripping over my own feet while I’m trying to type. (Yeah, “coordinated” is not my middle name.) Let us know how it works out for you. Oh, and I know you have a goal, how many miles a week are you aiming for? Ha ha, Monique – No peeking at the storyboard! And, I know it’s weird for me, but I don’t have a goal. I’m still doing my running and weightlifting, but I’m not counting the desk calorie burn. I want it to just increase my overall activity level. Can you post video of conversion from sitting to standing? Geek Desk has one that shows how the hydraulics work: http://www.geekdesk.com/default.asp?contentID=619 – or did you want to see my whole slide and shuffle routine? I am in awe! I could not multitask that well that I’d be able to walk while typing. You could – it’s easy! Thanks so much for taking the time to share this awesome set-up. Now that I’m a full time writer, I have to remember to get my patootie out of the chair! Your method seems like a great one. I hope you’ll keep us posted on how it works for you. Sure thing! And I totally agree – this is really something writers need to think about. We spend so much time on those patooties! This is fantastic, thanks. I do have a carpet and don’t relish the idea of dragging the treadmill on it; how foolish would it be to just try to put a chair on top of the treadmill when I need to sit down? I suspect it would work okay, John. At least on mine, the belt sits loosely on top of a solid surface, so it would be stable. You’d likely want to come up with something to protect the belt. It would be interesting to know how it worked out for you! Pingback: FF&P - A special interest chapter of the Romance Writers of America® » Walking My Way to Words and Miles! Very nice, but are you sure it’s deductible? I’d love to get a treadmill to use while working, but I’m getting a negative on that from the accountant. As equipment for home office, yes it is.